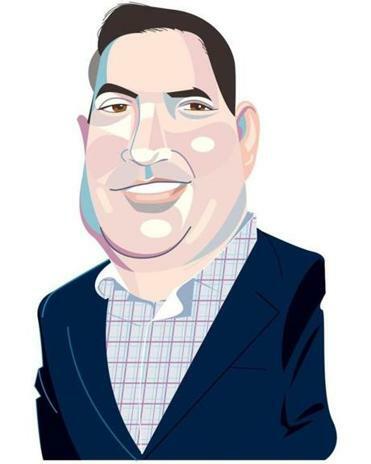 Brad Cohen launched Lycos Life to focus on connected digital devices. The way Brad Cohen sees it, there’s a clear parallel to be drawn between the Lycos of 20 years ago and the Lycos of today. Back then, Lycos made its name as a search engine, helping people navigate the Wild West of the World Wide Web, simplifying access to a seemingly mystifying realm of information and data. Now, Cohen’s growth plans for Lycos envision a parallel task: to help consumers connect everyday gadgets through what’s become known as the Internet of Things. The Lycos president and chief strategy officer launched the Lycos Life division last month, with a focus on selling wearable wristbands and rings that act as fitness trackers and password managers. These devices are also prepped to “talk” with home devices — from toasters to thermostats and coffee makers to cars — and would presumably become increasingly useful as more consumers trade up to more-connected appliances. Among the first Lycos Life deals: a partnership with Slingshot Power of Los Altos, Calif., to help provide homeowners quick access to their energy usage data. Cohen comes to Lycos from Ybrant Digital, the publicly traded Indian tech company that bought Lycos in 2010 for $36 million and later adopted the Lycos brand as its corporate name. He currently works out of Lycos’s Waltham office, and one in Colorado. Waltham has been Lycos’s longtime home, although it’s fair to say its local presence has diminished amid ownership changes over the years. The group — Lycos still maintains legacy Web businesses such as Tripod and Angelfire — relocated this past spring from Second Avenue in an office park on the outskirts of the city to 880 Main St. Only 30 or so members of Lycos’s 500-person global workforce are there now. But Cohen believes Lycos Life could be the venture that breathes new life into this faded 1990s icon. One of the earliest high-tech tenants in Boston’s Innovation District is mulling a move to what could be city’s next hot neighborhood for bits and bytes: Downtown Crossing. Bullhorn Inc., a maker of online recruiting tools, is nearing capacity at its longtime digs on Farnsworth Street. The company has been there since 2005 — before the Innovation District moniker caught on — and is in the midst of a growth spurt. Founder Art Papas said Bullhorn has hired 100 workers this year already and expects to add another 100 before the year is out. The expansion would bring the company’s total workforce to about 600. Papas said Bullhorn could add to the 45,000 square feet it occupies in its current location but could also relocate to Downtown Crossing. Surprisingly, Bullhorn’s hiring spree hasn’t been funded by venture capital but has come under private equity ownership. Papas sold his company to Vista Equity Partners of Austin, Texas, in 2012 but has remained in the chief executive’s seat. Interested in a paid, part-time job on a board in the financial or retail sector? Mark Rogers can make the connection for you. The former corporate lawyer just added an upgraded service to BoardProspects.com, a social media site he runs that’s geared for members of boards — or those aspiring to serve on one. The upgraded service allows companies to post their board opportunities for free. Potential applicants can search these opportunities for no charge, but need to pay if they apply through Rogers’ site. In the first four weeks of this new service, Rogers has signed on more than 40 companies and other organizations, he said, with a mix of paid and unpaid board seats. He said he is seeing interest from companies across the country, although the emphasis so far is on firms in the Northeast. Some well-known companies have already submitted job postings, including Duxbury’s Verc Enterprises convenience store group, Contravisory Investment Management in Norwell, and the South Shore-based Sullivan Tire chain. The Weymouth resident works out of his home and nearby coffee shops for now to keep costs down, but he said he has seen a big spike in revenue since he added the new service. Rogers said he has nearly 9,000 members, gathered in the three years since the site went live. The long-term goal is to convert as many of them to paying subscribers as possible by offering premium services. If it sounds a lot like a LinkedIn for corporate board members, it is.